Rotator Cuff Tendinopathy is a common condition representing 30-70% of shoulder pain disorders. This condition is more significant after the age of 50 and can be attributed to multiple factors. Rotator Cuff Tendinopathy has adverse consequences on the quality of life and is associated with long-term disability, retirement and high rates of chronicity (40-50%). While structural-oriented treatment may be effective in acute stages of musculoskeletal disorders (MSD), the outcomes are relatively poor in chronic stages. This proposes a question of what are the reasons beyond the development of chronic pain and disability in Rotator Cuff Tendinopathy? This simply leads us to consider CNS-related factors. Changes in neuronal structures, organization and properties (Neural plasticity) following MSD can possibly explain altered joint control and persistent pain. Numerous studies have investigated the CNS reorganization associated with different MSD and reported altered perception threshold to sensory stimuli, augmented pain perception and other similar symptoms presented bilaterally and away from the site of injury. A study by Nogomo et al  reported cortical reorganization correlating with the magnitude of MS-related pain. Overlap in spatial territory of cortical representation of muscles and alterations in intracortical inhibitory and facilitatory networks were also reported in different studies. This supports the hypothesis that structural abnormalities shouldn't always be associated with MS-related symptoms. Selective facilitation of needed muscles and inhibition of others for smooth performance, as well as intermuscular coordination may be disrupted as consequences of CNS reorganization. Motor cortical reorganization may persists despite alleviation of pain, leading to modifications in motor strategies to control the affected joint. Eventually, chronicity is likely to occurs as a result of the cascades of disruptions. Understanding maladaptive organizations has great clinical implications. While strength training and endurance training have shown induced angiogenesis in motor cortex and synaptogenesis within spinal cord respectively, skill training targets the motor map organization. Rehabilitation strategies should include motor control training in the rehabilitation of chronic RCT. The study of Roy et al  features different structural and global approaches to rehabilitate CNS reorganization, including sensorimotor training, pain education and postural exercises. There is a wide debate in the literature regarding shoulder pain terminology. Whether it is rotator cuff tendinopathy, subacromial pain syndrome or subacromial impingement syndrome we have to acknowledge the fact that shoulder pain is multifactorial and can be attributed to multiple reasons. However, in a clinical setting it is better to have objective measures to differentiate between rotator cuff tendinopathy and subacromial pain syndrome. This is particularly helpful for rehabilitation decision-making. Tendon overload/degeneration is likely to be a cause of subacromial pain. Tendons, especially Supraspinatus tendon, also could be compressed mechanically in the subacromial space. However, bony pathologies cannot be attributed as the sole cause of pain. Surgical approaches combined with rehabilitation was found to be no more effective than rehabilitation alone. Therefore, researchers suggest abandoning the ''impingement'' terminology. Neovascularization, referring to increased blood supply in tendons causing pain, was evident in the lower limb. Kardouni JR reported increased supraspinatus vascularity. Despite this finding, we still need more studies to confirm neovascularity as a contributing factor to RCT. The less vascularity in shoulder tendons and the difficulty in obtaining diagnostic images similar to lower limb tendons propose challenges to study this factor . Although there is a wide agreement towards adapting the terminology ''Tendinopathy'' instead of '' tendonitis'', inflammation was reported by Dean BJ. Tendon thickening was also present in tendinopathy as a result of abnormal collagen laydown. However, it starts thinning with progressive tendon disease which may lead to tear. But thickening isn't always a sign of tendinopathy as it was evident in overhead athletes and spinal cord injuries. Smaller distance between Acromion and Humerus AHD (7-8mm). Normally AHD= 10-15 mm. Occupation ratio: Supraspinatus Tendon:AHD. If the tendon occupies > AHD. AHD is at its smallest between 0-90°. Therefore pain above 90° is likely to be of other reasons. Confirm (Rule In): Specifity ≥ 80%. +Likelihood ratio ≥ 2.0. Since Scapula plays an integral role in bridging shoulder complex to the spine, overloading the RC tendons to maintain GH stability is possible.Therefor it is essential to integrate scapular rehabilitation in the RCT management program. 1- Neuromuscular Coordination and correcting scapular position consciously. 2-Restoring muscle balance rather than strengthening. 3-Integrating functional-specific or sport-specific exercises. To address middle and lower trapezius muscles hypoactivity/weakness, it is recommended to add external rotation in different positions e.g. diagonal pattern and with shoulder elevation. Elevation Exercises are preferred over isolated protraction when targeting serratus anterior muscle. Adding an external rotation component and/or performing exercises in a lying position with the head resting are suggested for decreasing upper trapezuis hyperactivity. Open chain exercises with external rotation has been shown to decrease hyperactivity of pectoralis minor. Overhead exercises or closed chain positions such as overhead retractions, overhead shrugging and wall slide are recommended to decrease levator scapula hyperactivity. Integrating core and peripheral muscles could be helpful in RCT rehabilitation, considering kinetic chain role of the scapula. Serratus Anterior activation could be targeted by conscious contraction of core abdominal muscles and during high load exercises. The functional stability paradigm describes the cascade of events following a MS injury leading to prioprioception deficits. Studies investigating joint kinesthesia in individuals with RCT and SPS have challenged this model. Fyhr C  reported no significant difference in active position sense between individuals with shoulder injury and controls. The results were different with regard to passive position sense when the injured shoulder was compared to the contralateral side. Another study found no difference between symptomatic and asymptomatic female workers in joint position sense at different shoulder movements. However, there was enhanced acuity of position sense associated with active internal rotation in symptomatic individuals. Pain, despite having a negative effect on muscle strength and performance, had a positive effect on movement sense. Fatigue was also studied to see the effect it has on proprioception, and found to have no affect on proprioception, movement speed or accuracy. Understanding cortical representations ''neurotags'' might explain the observed enhancement of proprioception. Neurotags have a role in building protective strategies to counteract or minimize the impact of injury and pain on movement control. Proprioception, being one of several variables modulating neurotags, may not be altered in chronic conditions. Although some studies reported enhancement in proprioception, the available evidence is not sufficient to conclude whether proprioception deficits are linked to chronic RCT. Future studies should focus on getting an in-depth insight of the central influence of pain rather than the peripheral effects only. This also should be reflected on clinical practice, in terms of prescribing exercises that address both central and peripheral impairments. In response to pain, many people develop neuroplastic changes in the peripheral and central nervous systems. 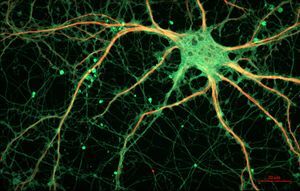 Neuroplasticity is associated with functional and chemical changes that induce sensitization rather than habituation. As a result, innocuous stimulus such as touch might be perceived as noxious ''painful'' . Systematic reviews reported significant presence of central sensitization(CS) in a subgroup of chronic shoulder pain, but its specific role hasn't yet been investigated sufficiently. Patients with chronic pain could be identified if they are having CS or not using a simple algorithm proposed by Nijs et al . Disproportionate, diffused pain are the most distinguishing criteria of CS. Central Sensitization Inventory and Scoring is also used to detect individuals with CS. Additionally, we can subcategorize individuals with CS-dominance as either persisters or avoiders. Persisters will resume their normal activities after pain subsides, while avoiders will restrict or decrease their level of movement. Regardless of CS-dominance, pain neuroscience education has been shown to be effective in chronic pain management. In addition, avoiders might benefit from graded exposure to exercises whereas pacing strategies might be helpful for persisters. 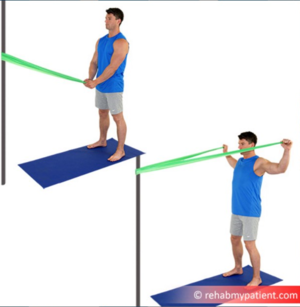 Meeus et al suggested starting with general exercises, especially if the patient has high levels of pain, then progressing to more specific exercise. General fitness exercises as well as manual therapy have shown analgesic effects in patients with chronic pain syndromes . Each patient is unique and it is important to remember that Rotator Cuff Tendinopathy is not caused by only one injury mechanism and that different factors may be involved in each patient. Every patient should receive a thorough clinical examination and the treatment plan should be based on those findings while considering evidence based treatments for each factor. ↑ Oliva F, Piccirilli E, Bossa M, Via AG, Colombo A, Chillemi C, Gasparre G, Pellicciari L, Franceschetti E, Rugiero C, Scialdoni A. IS Mu. LT-rotator cuff tears guidelines. Muscles, ligaments and tendons journal. 2015 Oct;5(4):227. ↑ Kuijpers T, van der Windt DA, Boeke AJ, Twisk JW, Vergouwe Y, Bouter LM, van der Heijden GJ. Clinical prediction rules for the prognosis of shoulder pain in general practice. Pain. 2006 Feb 1;120(3):276-85. ↑ Wilder-Smith OH, Tassonyi E, Arendt-Nielsen L. Preoperative back pain is associated with diverse manifestations of central neuroplasticity. Pain. 2002 Jun 1;97(3):189-94. ↑ Jensen R, Kvale A, Baerheim A. Is pain in patellofemoral pain syndrome neuropathic?. The Clinical journal of pain. 2008 Jun 1;24(5):384-94. ↑ Latremoliere A, Woolf CJ. Central sensitization: a generator of pain hypersensitivity by central neural plasticity. The Journal of Pain. 2009 Sep 1;10(9):895-926. ↑ Pelletier R, Higgins J, Bourbonnais D. Is neuroplasticity in the central nervous system the missing link to our understanding of chronic musculoskeletal disorders?. BMC musculoskeletal disorders. 2015 Dec;16(1):25. ↑ Ngomo S, Mercier C, Bouyer LJ, Savoie A, Roy JS. Alterations in central motor representation increase over time in individuals with rotator cuff tendinopathy. Clinical Neurophysiology. 2015 Feb 1;126(2):365-71. ↑ 9.0 9.1 Schabrun SM, Hodges PW, Vicenzino B, Jones E, Chipchase LS. Novel adaptations in motor cortical maps: the relation to persistent elbow pain. Med Sci Sports Exerc. 2015 Apr 1;47(4):681-90. ↑ 10.0 10.1 Burns E, Chipchase LS, Schabrun SM. Altered function of intracortical networks in chronic lateral epicondylalgia. European Journal of Pain. 2016 Aug;20(7):1166-75. ↑ Adkins DL, Boychuk J, Remple MS, Kleim JA. Motor training induces experience-specific patterns of plasticity across motor cortex and spinal cord. Journal of applied physiology. 2006 Dec;101(6):1776-82. ↑ Roy JS, Bouyer LJ, Langevin P, Mercier C. Beyond the Joint: The Role of Central Nervous System Reorganizations in Chronic Musculoskeletal Disorders. journal of orthopaedic & sports physical therapy. 2017 Nov;47(11):817-21. ↑ 14.0 14.1 Cools AM, Michener LA. Shoulder pain: can one label satisfy everyone and everything?. ↑ Kardouni JR, Seitz AL, Walsworth MK, Michener LA. Neovascularization prevalence in the supraspinatus of patients with rotator cuff tendinopathy. Clinical Journal of Sport Medicine. 2013 Nov 1;23(6):444-9. ↑ Dean BJ, Gettings P, Dakin SG, Carr AJ. Are inflammatory cells increased in painful human tendinopathy? A systematic review. Br J Sports Med. 2015 Aug 5:bjsports-2015. ↑ 17.0 17.1 Hermans J, Luime JJ, Meuffels DE, Reijman M, Simel DL, Bierma-Zeinstra SM. Does this patient with shoulder pain have rotator cuff disease? : The Rational Clinical Examination systematic review. Jama. 2013 Aug 28;310(8):837-47. ↑ 18.0 18.1 Hanchard NC, Lenza M, Handoll HH, Takwoingi Y. Physical tests for shoulder impingements and local lesions of bursa, tendon or labrum that may accompany impingement. The Cochrane database of systematic reviews. 2013 Apr 1. ↑ 19.0 19.1 Hegedus EJ, Goode AP, Cook CE, Michener L, Myer CA, Myer DM, Wright AA. Which physical examination tests provide clinicians with the most value when examining the shoulder? Update of a systematic review with meta-analysis of individual tests. Br J Sports Med. 2012 Nov 1;46(14):964-78. ↑ 20.0 20.1 Alqunaee M, Galvin R, Fahey T. Diagnostic accuracy of clinical tests for subacromial impingement syndrome: a systematic review and meta-analysis. Archives of physical medicine and rehabilitation. 2012 Feb 1;93(2):229-36. ↑ 21.0 21.1 Park HB, Yokota A, Gill HS, El Rassi G, McFarland EG. Diagnostic accuracy of clinical tests for the different degrees of subacromial impingement syndrome. JBJS. 2005 Jul 1;87(7):1446-55. ↑ Litaker D, Pioro M, Bilbeisi HE, Brems J. Returning to the bedside: using the history and physical examination to identify rotator cuff tears. Journal of the American Geriatrics Society. 2000 Dec;48(12):1633-7. ↑ Michener LA, Walsworth MK, Doukas WC, Murphy KP. Reliability and diagnostic accuracy of 5 physical examination tests and combination of tests for subacromial impingement. Archives of physical medicine and rehabilitation. 2009 Nov 1;90(11):1898-903. ↑ Castelein B, Cools A, Parlevliet T, Cagnie B. Modifying the shoulder joint position during shrugging and retraction exercises alters the activation of the medial scapular muscles. Manual therapy. 2016 Feb 1;21:250-5. ↑ Cools AM, Dewitte V, Lanszweert F, Notebaert D, Roets A, Soetens B, Cagnie B, Witvrouw EE. Rehabilitation of scapular muscle balance: which exercises to prescribe?. The American journal of sports medicine. 2007 Oct;35(10):1744-51. ↑ 36.0 36.1 Struyf F, Cagnie B, Cools A, Baert I, Van Brempt J, Struyf P, Meeus M. Scapulothoracic muscle activity and recruitment timing in patients with shoulder impingement symptoms and glenohumeral instability. Journal of Electromyography and Kinesiology. 2014 Apr 1;24(2):277-84. ↑ Cools AM, Struyf F, De Mey K, Maenhout A, Castelein B, Cagnie B. Rehabilitation of scapular dyskinesis: from the office worker to the elite overhead athlete. Br J Sports Med. 2013 May 17:bjsports-2013. ↑ Borms D, Ackerman I, Smets P, Van den Berge G, Cools AM. Biceps disorder Rehabilitation for the Athlete: a Continuum of moderate-to High-Load Exercises. The American journal of sports medicine. 2017 Mar;45(3):642-50. ↑ Toro AS, Cools AM, de Oliveira AS. Instruction and feedback for conscious contraction of the abdominal muscles increases the scapular muscles activation during shoulder exercises. Manual therapy. 2016 Sep 1;25:11-8. ↑ Lephart SM, Pincivero DM, Giraido JL, Fu FH. The role of proprioception in the management and rehabilitation of athletic injuries. The American journal of sports medicine. 1997 Jan;25(1):130-7. ↑ Fyhr C, Gustavsson L, Wassinger C, Sole G. The effects of shoulder injury on kinaesthesia: a systematic review and meta-analysis. Manual therapy. 2015 Feb 1;20(1):28-37. ↑ Haik MN, Camargo PR, Zanca GG, Alburquerque-Sendín F, Salvini TF, Mattiello-Rosa SM. Joint position sense is not altered during shoulder medial and lateral rotations in female assembly line workers with shoulder impingement syndrome. Physiotherapy theory and practice. 2013 Jan 1;29(1):41-50. ↑ Wassinger CA, Sole G, Osborne H. The role of experimentally-induced subacromial pain on shoulder strength and throwing accuracy. Manual therapy. 2012 Oct 1;17(5):411-5. ↑ Freeston J, Adams RD, Rooney K. Shoulder proprioception is not related to throwing speed or accuracy in elite adolescent male baseball players. The Journal of Strength & Conditioning Research. 2015 Jan 1;29(1):181-7. ↑ Wallwork SB, Bellan V, Moseley GL. Applying current concepts in pain-related brain science to dance rehabilitation. Journal of Dance Medicine & Science. 2017 Mar 1;21(1):13-23. ↑ Sanchis MN, Lluch E, Nijs J, Struyf F, Kangasperko M. The role of central sensitization in shoulder pain: a systematic literature review. InSeminars in arthritis and rheumatism 2015 Jun 1 (Vol. 44, No. 6, pp. 710-716). WB Saunders. ↑ Borstad J, Woeste C. The role of sensitization in musculoskeletal shoulder pain. Brazilian journal of physical therapy. 2015(AHEAD):00-. ↑ Noten S, Struyf F, Lluch E, D'hoore M, Van Looveren E, Meeus M. Central pain processing in patients with shoulder pain: a review of the literature. Pain Practice. 2017 Feb;17(2):267-80. ↑ Nijs J, Torres-Cueco R, van Wilgen P, Lluch Girbés E, Struyf F, Roussel N, Van Oosterwijck J, Daenen L, Kuppens K, Vanderweeen L, Hermans L. Applying modern pain neuroscience in clinical practice: criteria for the classification of central sensitization pain. Pain physician. 2014;17(5):447-57. ↑ 51.0 51.1 51.2 Meeus M, Nijs J, Van Wilgen P, Noten S, Goubert D, Huijnen I. Moving on to movement in patients with chronic joint pain. Pain. 2016 Mar;1. ↑ Voogt L, de Vries J, Meeus M, Struyf F, Meuffels D, Nijs J. Analgesic effects of manual therapy in patients with musculoskeletal pain: a systematic review. Manual therapy. 2015 Apr 1;20(2):250-6.